List your business on Accommodation, Eating Out, Weddings. Prices start from £30 for a 6 month listing. Large boxed ads on those pages which appear in the right hand column cost £25 per month. If you would like a bespoke advert on a specific page and location please email info@ryenews.org.uk. 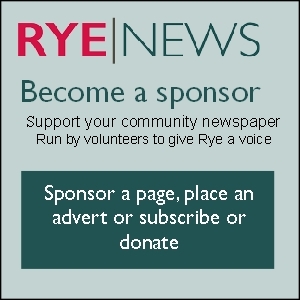 Rye news is about to enter its fifth year year as a not-for-profit enterprise run by a team of volunteers for the purpose of providing news and information about a wide variety of local happenings and events in the area in and around Rye. Local news plays a vital role in the sharing of news, opinions and and comment upon issues affecting national issues on our community. It provides a forum for expression of opinions and gives local people a voice. Research by Press Gazette in December 2016 found that 46 regional and local titles had closed in the previous 18 months, with big players such as Trinity Mirror and Johnston Press among those closing or merging long-established titles so it has never been more important to support local initiatives such as Rye News. We want to continue to bring you Rye News but we need to expand our team of journalists, editors and admin staff so we are asking for your support. Our volunteers have been listening to your feedback and we have upgraded the site to make it faster and offer you more resources but we need you to help us drive forward our and to survive in the longer terms funds are needed. Our editorial team work extremely hard each week to bring you the news. Our statistics show that our readers main interest is in News and Opinions. We'd like to expand our team of journalists so we can continue to bring you a range of news, views and in-depth articles on issues affecting our local area. What Rye News is offering the community? We now have a Jobs page where business sponsors in Rye are able to post their jobs free of charge. We hope that this will benefit businesses as well as attract a younger audience to our site. We have improved the Events Calendar which is easier to use and more comprehensive and will be a resource for local residents and visitors. In the longer term we will be developing the About Rye pages to provide information for locals such as clubs and societies, but also we want to make the site more informative for visitors to Rye and to businesses who rely on tourism. Please use the Submit Advert form to place an advert in Rye News. Select the size required and send your image in jpeg format. If you would like help with artwork, we can pass the work to a local designer for a fee of £25. Text ads are also available.